What woman doesn't like them, and adding flowers to cards makes them something to treasure. 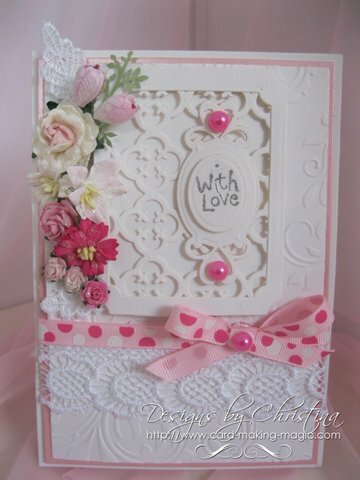 Adding these beautiful embellishments to you cards, especially the really "Girly" ones can make them stand out from the crowd. And I haven't met anybody yet that doesn't love the effect. In real life they fade and die so quickly and then they are gone. Such beautiful creations should last forever as they give so much pleasure. Well! by adding them to your designs they will be around for a lot longer. And the short video Small Flower Corsage will show you how to make a really stunning addition to your cards. Often the recipient will keep a handmade card as a treasured memory of you and the beautiful card that you have created for them. Use two or three, of different sizes, layer them up in colour combinations for a stunning effect. Sprinkle them with Glitter or simply add a Gemstone to the centre. Add them in groups, to frame your image, and add in some smaller flower buds, just as the florist would do. 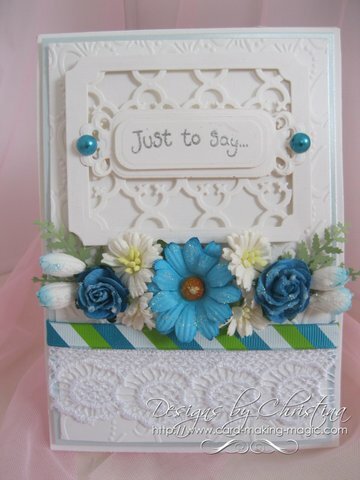 Let the tutorial give you some ideas of how to add flowers for a beautiful display on your cards. A single flower can say so much when added to the right kind of card. It is an option to consider, especially if you are asked to make a "Sympathy" card. If you want to add your own handmade flowers then click the links to find more ways to make them. Any of these will give a lovely effect incorporating the colours you have used to make the card.